Well, we'll be honest here, we thought we'd comfortably seen the last of ol' Duke Nukem. The flat-topped, cigar-chewing symbol of big guns and even bigger sexual innuendo had finally ridden off into the sunset following some pretty terrible gaming outing, but how wrong were we. If a slew of leaked details are to be believed, Mr Nukem is preparing for a special remake. 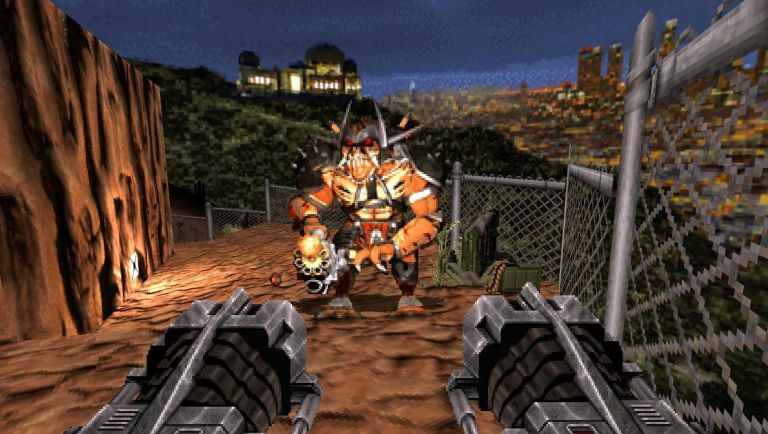 It all started with a countdown that's set to reach zero next week, marking the 20th anniversary of the original Duke Nukem 3D in 1996. Then, seemingly out of nowhere, Reddit user Tezla55 was contacted by someone he claims is close to be working close with said mystery project. According to that source, the game is a reboot/remake of Duke Nukem 3D, entitled Duke Nukem: World Tour and is being developed by Texan studio Nerve Software, which has previously made a name for itself contributing support development to the likes of Call of Duty from 2010 to last year's Black Ops 3. The source has also stated the game will include a co-operative mode and online deathmatch, although the report seems a little sketchy on that last feature so don't be surprised if some of these details turn out to be hearsay and conjecture come the potential reveal next week. While we have plenty of fond memories of playing the 1996 original, the most recent Duke-fronted instalment, 2011's terrible Duke Nukem Forever (which notched up 15 years on the development clock) put any of those positive vibes to bed. So in an age where every single game seems to be getting a PS4/Xbox One re-release, the return of the Duke certainly fits with the zeitgeist. We'll know where when said countdown reaches zero on Friday, 2 September at 5pm PT.